Coinciding with the opening of Solo: A Star Wars Story. On my way out of the theater, a reporter stopped me for a radio interview. “Did you think it was fun?” I replied “Yes” but it was so much more. I would return several times to see it again. Star Wars ran there at the Coronet for 29 weeks. The new Star Wars movie opens in over 10,000 theaters in the US. How times have changed. The original Star Wars was not expected to be a success, far from it. The studio was not optimistic, hence only 40 opening theaters. The head of 20th Century Fox at the time was Alan Ladd, Jr. He agreed to produce the film with an initial $8M budget because he was impressed with George Lucas’ 1973 American Graffiti. Even Lucas was not hopeful. Instead of going to the opening he went to Kauai, Hawaii with his friend Stephen Spielberg to commiserate. While there, they conceived of Indiana Jones, named after Lucas’ dog, which was subsequently filmed there, and would make Harrison Ford a much bigger star than he would have been as just Han Solo. The general pessimism about the movie allowed George Lucas to take a small salary, but he negotiated the retention of a sizable chunk of the merchandising rights. That first book turned into a book empire. The Star Wars Expanded Universe also includes comic books as well as games — board, video, online, and computer — plus TV and movies. There were t-shirts, toasters, lightsabres, bottle openers, headphones, tape dispensers, popcorn makers, action figures, watches, cups, pens, slippers, and class rings. And lunch pails, shower curtains, and underoos. The movie is considered either #1 or #2 highest grossing film of all time, perhaps behind Gone with the Wind, adjusted for inflation. Though George Lucas sold Lucasfilm for $4.05B a few years ago to Disney, the total value of the franchise is over $30B. And Lucas holds the second largest block of Disney stock, after the Steve Jobs family, who sold Pixar to them. Speaking of Disney, they have featured a Star Tours ride at several of their parks around the world for many years. I visited that attraction at Disneyland Paris, in what is called Discoveryland. Additionally, each of the parks features heavy Star Wars themes in terms of music, shopping, and rides in their respective Tomorrowland. Disney has broken ground on a 14-acre Star Wars Land in both California’s Disneyland and Florida’s Walt Disney World. Here’s a picture of the construction beyond Frontierland in Disneyland, California from a recent visit in April 2018. Since the first film, I’ve seen all the subsequent films the first day they came out. I made the mistake of reading everything I could get my hands on between the first and second films — including the August 1977 issue of Rolling Stone — and it spoiled The Empire Strikes Back. I’m more vigilant about reading spoilers. I’ve recently re-watched the previous films, in what is called Machete Order: Episodes IV, V, II, III, VI. Why this order? The prequel trilogy is essentially back-story, and everything in Episode I that you need to know gets mentioned in Episode II. Episode III then provides more impact to Episode VI. J.J. Abrams, who had a successful run at the recent Star Trek reboot films, co-wrote, directed, and produced Episode VII. There is in popular culture an unnecessary rivalry between Star Trek and Star Wars, but I like both. Star Wars differs from Star Trek in that the former spends less time on the science and features “lived in” spaceships that are not military clean. Its themes are different as well. While Star Trek always mirrored current-day political and social issues, Star Wars takes a more heroic or epic approach. Star Wars: Episode VIII – The Last Jedi was written and directed by Rian Johnson who took yet another direction from J.J. Abrams, and did not answer all of the questions posed in Episode VII. Meanwhile, other films that are non-saga “anthology” movies from the Star Wars universe include Rogue One: A Star Wars Story, reviewed here, and today’s opening of Solo: A Star Wars Story. 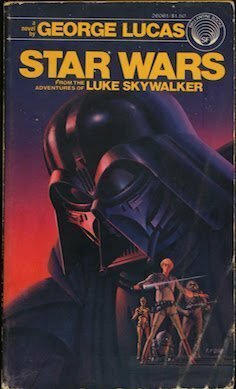 It’s well known that George Lucas favored Joseph Campbell’s Power of Myth and the Hero’s Adventure. The first Star Wars movie picks that up as Luke wants “to become a Jedi like my father before me.” Themes of (Jedi) knights of the roundtable, squires (padawans, apprentices), and fair princesses to be rescued harken back to King Arthur’s court. In that way, it plays more to fantasy themes than traditional sci-fi themes. And because it was “A long time ago in a galaxy far, far away” rather than the future, you see a parallel with the fall of the Roman Senate and its Republican form of government, to be replaced by a Galactic Empire and a dictatorial power-hungry Emperor. But you cannot miss the sci-fi homage to Isaac Asimov’s Foundation trilogy novels with its Galactic Empire. Nor Kurosawa’s Hidden Fortress movie. Nor the drones (droids) from Douglas Trumbull’s Silent Running film. We now have eight movies in the saga, but there will be more. We can expect the next saga movie in Christmas 2019 as Star Wars: Episode IX code-named “Black Diamond”, the conclusion of the third trilogy directed by J.J. Abrahams. You will go see Solo: A Star Wars Story. This is the movie you’re looking for.